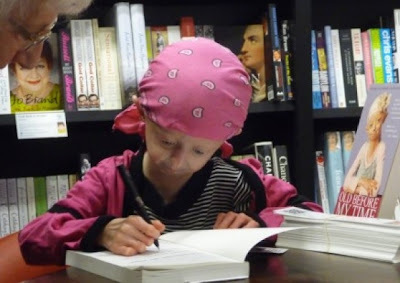 When she celebrated her 14th birthday Dec. 3, 2011, Hayley Okines had surpassed the average lifespan for someone born with progeria, the rare disorder that turns children old before they reach adolescence. Because progeria ages the body at eight times the normal rate, Hayley's skin is thin and papery; her bones fragile and her organs threatened by diseases typically associated with the elderly. 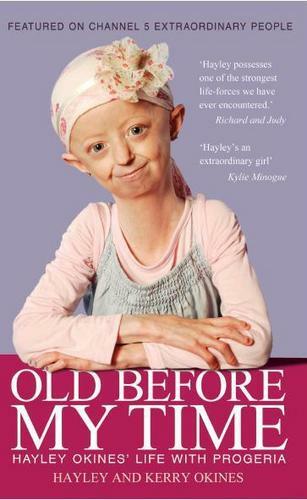 Progeria patients die from heart attacks or strokes at an average age of 13, a number that carried extra weight for Hayley because doctors had told her parents she'd "only live to thirteen," the British teen recalls in a new book, "Old Before My Time: Hayley Okines' Life With Progeria." The disease, which takes its name from the Greek word "progeros," meaning prematurely old, involves a mutant protein called progerin that accelerates physical aging, but leaves intellect intact. In the book, Hayley's fantasy of meeting pop idol Justin Bieber (realized in a 13th birthday surprise fostered by her Twitter followers) and her attitude about school ("I hate school. The work is pointless.") make clear she's a pretty regular teen in most respects. Yet, she cannot help feeling different. She's smaller than her younger siblings, wears bandannas to cover a bare scalp and can't find school uniforms to fit her tiny frame. "Mum says I am one in eight million because my condition is so rare," she says. Hayley, of Bexhill, England, is among 89 children in 32 countries living with progeria, according to the "Find the Other 150" campaign, which is trying to identify all of the estimated 150 children with the disease. Unlike most of them, Hayley has grown up in the spotlight, the subject of British television documentaries with titles such as "The Girl Who Is Older than Her Mother," and news stories tracking her participation in clinical trials at Children's Hospital Boston and the nearby Dana-Farber Cancer Institute. She has numerous followers of her Facebook page, Web page and Twitter posts. She's swum with dolphins in the south of France, toured the Egyptian pyramids and met with such notables as Prince Charles. 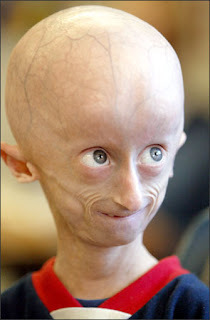 She's among three progeria patients featured in an ABC special with Barbara Walters, "7 Going on 70," which will have an encore showing Saturday at 10 p.m. ET. Two U.S. girls interviewed for that program, Lindsay Ratcliffe, now 8, of Flat Rock, Mich., and Kaylee Halko, also 8, of Monclova, Ohio, are thriving and looking forward to participating in the next planned clinical trial in Boston, their mothers told ABC News. Hayley's book, co-written by her mother, with each contributing separate chapters, demonstrates that by any measure, Hayley leads an extraordinary life. The blue-eyed baby who wasn't growing or gaining weight as quickly as other infants still took her first steps at 10 months and was having conversations by 18 months. "She definitely seemed much wiser and more inquisitive than other 20-month-old toddlers," her mother writes. Her parents were crushed when Hayley was diagnosed with Hutchinson-Gilford progeria syndrome. But Hayley has had the good fortune to grow up at a time when science might provide her with a better, longer life than patients diagnosed in previous decades.